Yoda. Q. Nanny McPhee. Spock. Gandalf. J.A.R.V.I.S. Dumbledore. Mary Poppins. Merlin. We often think of mentors as wizened old men (and women) who give the hero/ine vital information as the quest begins. Mentors are wise, mysterious, a little deranged, and incredibly awe-inspiring. They can become much-loved when they recur in a series, even as they create challenges or pose riddles that the hero/ine must understand. A staple ingredient of the archetype pantry, the mentor appears early in the story. Often, s/he ponders the push needed to get the hero/ine embarking on the quest. Gandalf entices Frodo. Dumbledore guides Harry from his entrance to Hogwarts on to his re-making at the series’ end (another entrance with an exit). Today, we view the mentor as a teacher who guides, imposing challenges mental and physical that the hero/ine must overcome. To fall short is to face destruction at the critical moment—as Luke left Yoda too soon and was saved only by luck from certain destruction. in the Odyssey is the goddess Athena in disguise. Athena is appropriately associated with mentors. She is the goddess of wisdom, as the Greeks cunningly separated wisdom from learning/education. As goddess of battle, she oversees skilled fighting which requires training and discipline as opposed to the blind and violent chaos of Ares’ war. The goddess of natural crafts, like weaving and carpentry, masonry and the like—using something close to its original form turned to a new purpose. 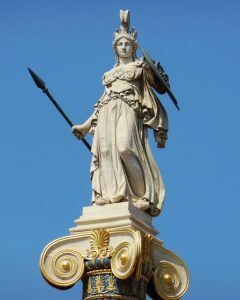 In effect, Athena epitomizes the role of the mentor in her sacred obligation. A mentor can give information freely but can also withhold vital information. Worse, the mentor can provide advice only to have it ignored. Gods and mentors are sacred and saving in their gifts. Through these gifts, the hero/ine proves her/his worth. S/he should be appropriately respectful of the quality of the gifts received, even if s/he doesn’t quite understand the worth. As the god intercepted Odysseus and gave him moly to defend against Circe, other mentors give actual gifts: special devices, like Q in the Bond stories; special insights, like Yoda in Star Wars. “When you need me, but do not want me, I must stay. When you want me, but no longer need me, I must go,” she says early in the first film. “We will never want you,” the boy cries. “Then I must stay,” she calmly replies. And we all cry when she leaves at the film’s end. A central point in a network, the nexus points the hero/ine to the next stage or person. Dumbledore in the Harry Potter series gathers in from many points. No matter who he enlists, he receives information and loyalty from them, which he uses to send more threads out, weaving a metaphorical great cloth of knowledge that will shield and armor Harry. Gandalf is also a nexus even as he works alone. He has copious connections and taps into them constantly. Only he crosses all ethnic groups in Tolkien’s stories: the elves and dwarves, hobbits and men. And he is not afraid to venture into the Dark, yet he can also be blinded and become captive of the Dark when he is unwary. The challengers of the hero/ine’s complacency, mentors propel the protagonist into the quest, ready or not. Often, mentors must break her/his rock-hard hubris. The hero/ine must learn to look into the far distance, between the east of where s/he is and the west of where s/he needs to be. Nowhere is the Duality of the mentor more clearly presented than with the mentor as obstacle. The mentor may be a healer (shaman) yet also a danger to the hero/ine. Both bright and dark, he may deliberately lead the protagonist astray. Whether independent or allied, the well-intentioned mentor is the most dangerous. This is the Lady Russell in Jane Austen’s Persuasion, who clearly wants the best for Anne Eliot but certainly does not understand who is best for Anne. The comic mentor of Donkey in Shrek clearly understands the darkness of the world, as he urges Shrek to think of the world as “parfait, not onion” and “nice boulder”. Yoda is an easy selection. An unexpected one is Katsumoto in The Last Samurai. Sacred and mysterious or fallen and scarred, a core member of a community or an isolated hermit, struggling on his own path or already enlightened, the mentor’s connection with the hero/ine must develop slowly. For trust is at the heart of that connection. Trust is the basis of the connection in the flawed book Eragon with the character of Brom and successfully with Obiwan Kenobi in Star Wars. Crichton’s Eaters of the Dead. To explain my reasons would take days, so let’s focus on a single point. One of the clever details in the story is that crazy woman under the ledge. Our heroes consult her near the end. “We need your wisdom,” the queen says to her. In the Archetypal structure, this crazy woman does not serve as the story’s mentor (that’s the character Herger). Her entrance to the story falls right before the Ordeal. The more this riddling mentor says–“In the ground, find them in the ground”–the less the heroes understand—just as my explanation of the film is going LOL. And then, when the heroes begin to find the monsters they must confront, her words become clear as the fog of rational, established thinking is swept away. Like Frigga, Odin’s wife, the crazy woman understands the mysterious yet she cannot speak it plainly, if at all. Here, when the heroes approach the lair of the monsters, Crichton turns clever again, for the character Ibn—who has needed so much instruction—becomes mentor to the group, for he is the first to understand the crazy woman’s wisdom. The earliest hero in Greek myth is Perseus, a stripling who never thought things through before he jumped in (typical teenager). When he volunteers to bring back the head of the Gorgon Medusa, he doesn’t even know where to look. First, he visits the Dodona (early Paleo diet: they eat ground acorns for their flour). They send him to the Graiae, the monstrous Gray Women, a trap if I ever saw one. He doesn’t fall into that trap. The Gray Women have swan necks, are winged, and share one eye among them (past, present or future OR here, there, everywhere). 3 Mentors: Dodona for guidance, Graiae for a dangerous obstacle that he had to escape before they trapped (and ate) him, and the Hyperboreans, a dangerous obstacle that becomes a gift-giver. And each one a part in the wider nexus of mentors. Test the readiness of the hero/ine. Guide toward the perspective needed for the quest. With well-crafted mentors, the hero/ine can step through the looking glass.